All Wood Twin Bunks from as low as $249.00! all our beds are handmade by a woodcrafter and family. and we pass that savings onto you. ﻿We offer delivery (in the DFW area) and set-up. ﻿ We do not offer shipping at this time. Thank you for your terrific response to our new Burned Wood Finish! Each bunk is hand crafted and hand burned at order! 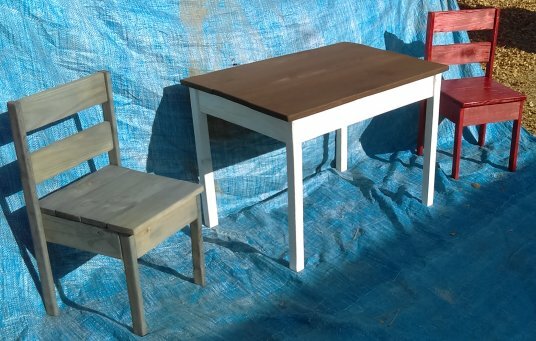 Our latest offering--a child's table and chair set! Great for kid's crafting, art or extra kids' seating for Holiday meals! You can choose to have two or four chairs with your table, and choose to have your new table and chair set with or without stain! Thank you for your orders! Even though it's after the 4th, we are still offering our new picnic tables for order. These tables and benches are made with solid 2x6 Southern Yellow Pine boards! They are strong, durable and heavy! It comes with two benches and you can customize the table length to 8' and width to 33". Your new solid Southern Yellow Pine Picnic Table and two benches comes with water-sealed stain in several choices of colors for $550.00. We buy our Southern Yellow Pine at a local Lumber Yard. Made in Texas by Texans! The natural beauty of the Southern Yellow Pine is enhanced by its minor cosmetic flaws. Each knot, irregular wood grain or other appearance imperfection gives the wood character and depth.